WhisperPhone® is a hands-free, acoustical headset that helps children and adults focus on and hear the individual sounds of words more clearly as they learn by processing language aloud. This hands-free, acoustical voice-feedback headset helps students hear phonemes, the sounds that compose words. Phonemic awareness is a key predictor of literacy success, according to the National Reading Panel. WhisperPhones are proven to help students with reading, writing, spelling, learning a new language and memorizing lines for the theater. This tool is great for all activities that require increased comprehension and concentration. Product is recommended for children five years of age or older. SOLO fits kids in grades K-4; SOLOXL fits kids in grades 5 and up. WhisperPhone DUET: Kids learn to read by reading aloud. There’s a reason: auditory learning is powerful. 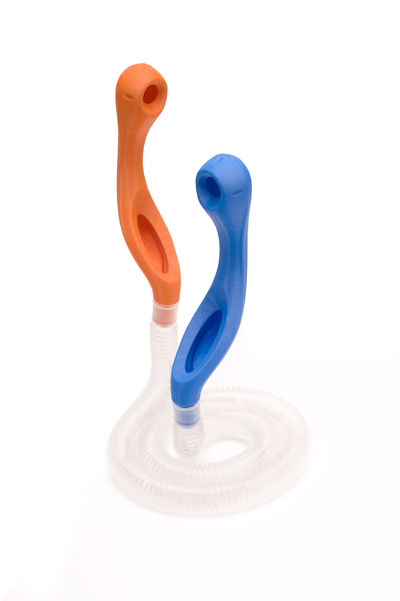 WhisperPhone® Duet increases literacy results. Try Duet with WhisperPhone Reader’s Theater! Duet helps students learn how to read with expression. You will be amazed at what Duet can do! Reader’s Theater: WhisperPhone® Reader’s Theater includes 10 scripts, 10 scene setters and 10 coordinating exercises written by literacy experts and teachers. The scripts feature two characters in a telephone conversation about “How Things Are Made.” Students practice reading with expression in pairs. A true literacy-builder! Recommended for primary grades. Reader’s Theater includes a CD containing all the materials and a Teacher’s Guide. Authored by Dr. Timothy Rasinski, Gay Fawcett and Karen Brothers. Reader’s Theater was designed to work perfectly with WhisperPhone Duet. Try it!